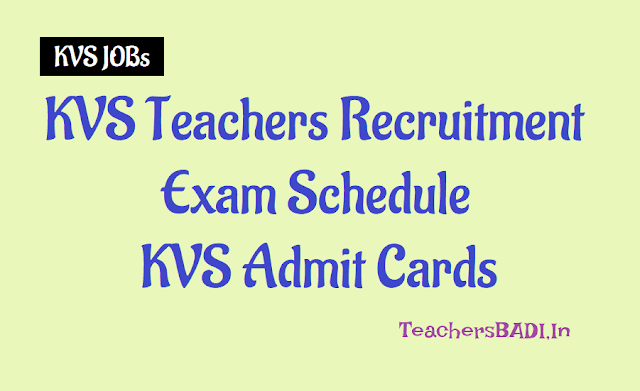 KVS PGTs, TGTs, PRTs Recruitment 2018 Exam dates, Admit Cards (Kendriya Vidyalayas), KVS Teachers Recruitment 2018 Exam schedule, Admit Cards @ http://kvsangathan.nic.in/, KVS Recruitment, KVS Teaching Staff Recruitment 2018 Exam schedule: The Kendriya Vidyalaya Sangathan (KVS) has published the examination schedule for the KVS Teacher Recruitment 2018 exam for North Eastern region on the official website, the link for which is kvsangathan.nic.in As per the schedule, the KVS will conduct the exam from December 22 to December 23 at various test centres across the region. KVS PGT, TGT, PRT & Librarian recruitment exam to begin on December 22, 23. The Kendriya Vidyalaya Sangathan (KVS) is conducting the recruitment examination for PGT, TGT, PRT, Librarian posts starting from December 22 & 23, 2018, across the country. KVS will conduct the exams in three sessions - morning, afternoon and evening. The morning session will begin at 9.00 am and concludes at 11.30 am. The afternoon session will be held from 12.30 pm to 3.00 pm and the evening session will be conducted from 4.00 pm to 6.30 pm. The candidates need to appear for interview session also which will be of 60 minutes. Candidates who will appear in the examination need to take a look at the exam pattern for both the days of exam. This will help the candidates to take up the examination is a more confident manner. Below is the separate exam pattern for all the posts to be filled through this exam. The candidates who have applied for the KVS recruitment 2018 examination can check the exam patterns for different posts below. KVS Admit Cards: KVS Admit Cards for Principals, Vice-Principals, PGTs, TGTs, Librarian and PRTs: The Kendriya Vidyalaya Sangathan released the admit cards for the Principlas, Vice-Principals, PGTs, TGTs, Librarian and PRTs 2018 on the official website of Principals, Vice-Principals, PGTs, TGTs, Librarian and PRTs - http://kvsangathan.nic.in/ . Candidates who have applied for the examination can check and download their admit card from the Principals, Vice-Principals, PGTs, TGTs, Librarian and PRTs website - http://kvsangathan.nic.in/. Candidates are advised to download their Principals, Vice-Principals, PGTs, TGTs, Librarian and PRTs 2018 Admit Card from the official website - http://kvsangathan.nic.in/ - only. In case you have also applied for the Principals, Vice-Principals, PGTs, TGTs, Librarian and PRTs 2018 examination, you can follow the steps given below to check and download your admit card. The Kendriya Vidyalaya Sangathan or KVS, New Delhi has released the KV admit card for the recruitment exam scheduled for this month for various teacher and related posts in the organisation. The KVS has now released admit card for for the posts of Primary Teacher, TGT (P&HE, AE, WE), PRT (Music), PGT, TGT and Librarian and the same be downloaded from the KVS website, kvsangathan.nic.in. The KV PGT, TGT and other recruitment exams will be held on December 22 and December 23 in various centres across the country. Step 3: A pop-up page will appear, enter your Principals, Vice-Principals, PGTs, TGTs, Librarian and PRTs 2018 application number, date of birth, security pin and click on login. Step 4: Your Principals, Vice-Principals, PGTs, TGTs, Librarian and PRTs 2018 admit card will be displayed on the screen. Carefully check all your details such as name, paper, date of birth, gender, test centre name, city, state, code of eligibility and category on your Principals, Vice-Principals, PGTs, TGTs, Librarian and PRTs 2018 admit card. Step 5: You can download it and take a printout for future reference. The examinations will be held in different sessions on December 22 and December 23, 2018. The candidates must note that there are separate admit cards for both the days. Candidate must download them separately as per post applied. Any issue relating to KV admit card in respect of these recruitment examinations, communication may be sent on email at rps313kvshq@gmail.com or telephone number 011 26565671 up to December 10, 2018. "It may be noted that no requests for change of centre shall be entertained," said a KVS notification. KVS recruitment Exam Dates 2018: Kendriya Vidyalaya Sangathan (KVS) will conduct the written exam for recruitment of PGTs, TGT, PRTs and Librarian in December. KVS has released the exam schedule on 08-10-2018. KVS will conduct the written exam on December 22 and 23. The exam will be held in three shifts. The written examination for PGTs, TGTs and PRTs will be held on December 22 and 23, 2018. According to the schedule released on the official website, the exam will be held in three session on both the days. The first session will be held from 9am to 11.30am, the second shift will be held from 12.30pm to 3pm and the third session will be held from 4pm to 6.30pm. On December 22, the exam for primary teachers will be held in first session while exam for trained graduate teachers (P and HE, AE, WE) will be held in the second session and exam for PRT (Music) will be held in the third session. On December 23, the exam for primary graduate teachers will be held in first session while exam for trained graduate teachers will be held in the second session and exam for librarian will be held in the third session. KVS had invited online applications for recruitment of Principals, Vice-Principals, Post Graduate Teachers (PGTs), Trained Graduate Teachers (TGTs), Librarians and Primary Teachers (PRTs) in the month of August. The application process began on August 24 and closed on September 13, 2018. The examination will be held in the offline mode. The number of tentative vacancies to be filled through the examination is more than 8,000. There are 76 posts for principal (Group A), 220 for vice principal (Group A), 592 for PGTs (Group B), 1900 for TGTs(Group B), 50 for Librarian (Group B), 5,300 for Primary Teacher (Group B) and 201 vacancies for Primary Teachers (Music) (Group B). KVS Teachers Exam Schedule: The Kendriya Vidyalaya Sangathan (KVS) released the dates and time schedule of examination for Post of Post Graduate Teachers (PGTs), Trained Graduate Teachers (TGTs), Librarians and Primary Teachers (PRTs) (advertisement no.14). The official notification read: "Admit cards for the exam will be uploaded on KVS website in due course separately," reads the official notification. The recruitment will be for the states of Assam, Meghalaya, Arunachal Pradesh, Nagaland, Manipur, Mizoram and Tripura. Moreover, KVS has urged 165 candidates, who had not uploaded their signature/photograph in the prescribed format while submitting the application, to upload it urgently. Kendriya Vidyalaya Sangathan (KVS) has notified recruitment for Principal, TGT, PGT, PRT, Librarian and Vice-Principal posts. Note: The number of vacancies indicated above is tentative and subject to change. Kendriya Vidyalaya Sangathan, KVS Exam Dates have been released for the KVS Recruitment 2018 of Principal, Vice Principal, PGT, TGT, etc. The examination for Principal and Vice Principal would be conducted on November 3, 2018 and the examinations for TGT, PGT, etc. would be conducted on December 22 and 23, 2018. Check complete schedule below, also available on kvssangathan.nic.in. KVS has released the notification for recruitment of 8,339 posts of Principal, Vice- Principal, TGT, PGT, PRC and Librarian vide Advertisement 14 on September 13, 2018. This time, as a special measure, KVS has allowed CTET 2018 applicants to apply for the said posts. The Examination schedule is provided below. Mode of selection: Candidates will be selected on the basis of their performance in written examination and interview put together. The KVS reserves the right to decide the cut off marks in written examination and interview separately. The decision of the KVS about the mode of selection to the above posts and eligibility conditions of the applicants for interview shall be final and binding. No correspondence will be entertained in this regard. Kendriya Vidyalaya Sangathan (KVS) would release admit cards for the teacher recruitment exam scheduled on 22 and 23 December 2018 for North Eastern region. Candidates who had registered for the exam can now download the admit card at the official website kvsangathan.nic.in. KVS had released the exam time table on 08-10-2018. While recruitment exam for PGTs and PRT will be held in 22 December, it will be held on 23 December for TGTs. The exam will be held for selecting candidates for 8339 vacant teaching posts in Assam, Meghalaya, Arunachal Pradesh, Nagaland, Manipur, Mizoram and Tripura. Candidates can also check the schedule on the official website by clicking on the link provided above. The admit cards for the November 3, 2018 examination are expected to be released by next week on the official website. Candidates are advised to keep a check on the official website.